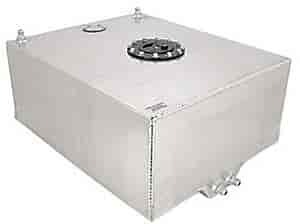 Foam filled, 0.090" wall thickness aluminum fuel cells include a flush mount aircraft type lid and are equipped with foam, two -08AN or -10AN (3 & 5 gallon cells only) male outlets, an -08AN male vent and an -08AN male rollover valve fitting. Available in a natural aluminum or an oil & fuel resistant black powder coat finish. Fuel cell mounts are now required by most sanctioning bodies for use with aluminum cells (sold separately). Check your rule book for requirements. 15345 is rated 4.8 out of 5 by 5. Rated 5 out of 5 by Professor Jerry from Great Fuel Cell I bought this cell about a tear ago and installed it in the bed of my truck. It's been working flawlessly. Rated 5 out of 5 by NYSFOP from Excellent item at a good price..Very compatible and easy to install. Rated 4 out of 5 by 1981 82 ELCO from Love the look and metal quality! I had this product for a 3 weeks great replacement for a polyurethane one that was warped and a pain to use plus the bigger size really helps keep me away from the pump so often. Only issue is the sending unit doesn't work where as the old one did sometimes but I haven't got to talk to tech support to troubleshoot because I've been enjoying driving my awesome EL Camino. Also looks great and was a breeze to install!!! Highly recommend jegs high performance products. Can you run 93 octane and higher in this cell without removing the foam ? If not what fuel cells do you offer that can ? This will work with 93 octane unleaded premium and most other racing fuels. Can this be used with carbureted engines? I have an old truck I would like to use it on. Yes, you will need to add the appropriate fuel pump for your application. Is this product diesel fuel compatible? The fuel cell is compatible, the foam should be removed if using diesel fuel. Sending units work with most GM factory gauges with 0-90 OHMS. The center post wires directly to the gauge and you must ground the sending unit from one of the outside bolts of the sending unit to your frame. Always make sure your fuel cell is properly grounded and vented. Do you have a direct replacement for the gm sending unit that comes with this cell? Running foam inside. Can you replace the filler neck with a different brand such as RCI. Am looking for a 45 degree angle filler neck to fit this model. Yes, the RCI - Part Number: 821-7036B should work for this application.